We have now completed the holy Forty Days of fasting known as Great Lent. Today we enter into the week of our Lord’s Passion with the commemoration of the raising of Lazarus from the dead. Father John’s homily at the Divine Liturgy today can be heard on the Homilies page under the Explore tab of this website. On the feast of Holy Theophany/Epiphany we again walked down to the stream that runs next to our church and blessed the waters that supply our North Kitsap aquifer. Deacon Daniel Lattier, our former parishioner, was ordained to the holy diaconate yesterday by Archbishop Michael at Saint Tikhon’s Seminary. May God grant him and his family many years of life and ministry in the Church! Axios! Our rector Father John recently co-hosted Father Evan Armatas’s popular live call-in program Orthodoxy Live on Ancient Faith Radio. Click here to listen. 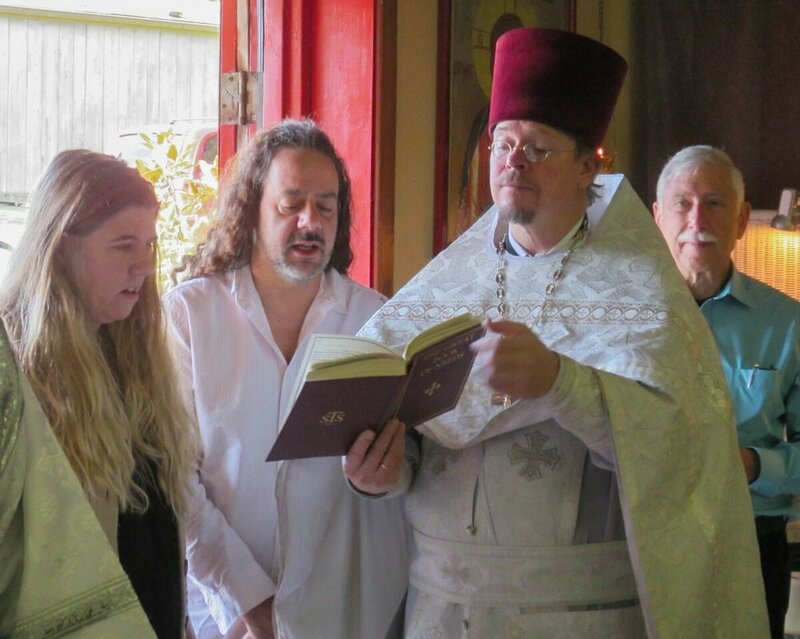 Saint Tikhon's Seminary launched its 2018-2019 year with our former parishioner Daniel Lattier in attendance. He, his wife Kelly, and their five children moved to Pennsylvania over the summer to begin a course of formation that may, God willing, lead to ordination to the holy priesthood. They are all in our prayers! Go to the Sunday Homilies page of our website or click below to hear Deacon James's recent homily about the faith of the Centurion in Matthew 8. Two of our catechumens making their statement of the Orthodox faith prior to Holy Chrismation. On Holy Saturday five of our catechumens were received into our parish through holy baptism. Here they are with their sponsors.